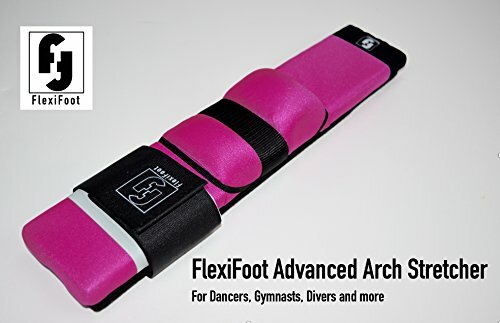 FlexiFoot Advanced Arch Stretcher is designed to improve foot and arch flexibility for dancers, gymnasts, swimmers, divers, synchronized swimmers and more! FlexiFoot Advanced combines two stretching options using Theraband resistance and Hook and Loop technology to create a secondary resistance level. This allows you to control or resistance level. FlexiFoot Advanced is a ruggedly constructed stretcher with a raised and padded heel cradle that provides comfort and increased stretch range. The back of the heel cradle is elevated to provide ankle support. This product is for serious athletes. Point range will improve with use but as with all athletic pursuits, listen to your body and work your way up to full stretch. If you have any questions about this product by FlexiFoot, contact us by completing and submitting the form below. If you are looking for a specif part number, please include it with your message. SoftTouch Ballet Barre 4.5ft Portable Dance Bar - Adjustable Height 31" - 49" - Freestanding Stretch Barre 54"